Gold Wing riders – Stretch your legs and make yourselves comfortable! National Cycle has engineered the perfect set of Comfort Bars for your favorite highway pegs or footrests. Attach your footrests using the optional swivel-adjustable mounts, which allow upward, rearward or downward positioning. 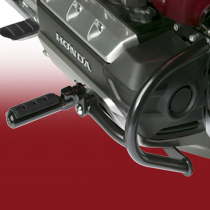 Or install your favorite clamp-on footpegs at any location best suited for you. Stretch your legs and make yourselves comfortable! National Cycle has engineered the perfect set of Comfort Bars for your favorite style of highway pegs or footrests. Attach your footrests using the optional swivel-adjustable mounts, which allow upward, rearward or downward positioning. 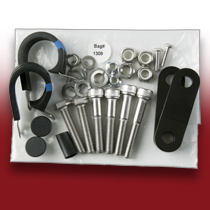 Or install your favorite 1.00" (24mm) clamp-on footpegs at any location best suited for you. 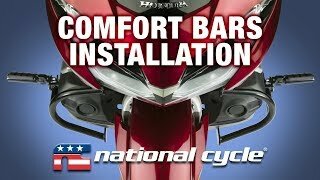 There is no easier way to get comfortable than with National Cycle's Comfort Bars. Designed exclusively for the GL1800 Gold Wing, the sleek, tight-fitting design of the Comfort Bars makes them look like they belong on the bike – because they do! The ability to add a secondary footrest position to the GL1800 will maximize rider comfort, especially on long tours. Plus, you'll appreciate the quality construction and fine finish of the Comfort Bars. Available in stainless steel with an electropolished finish or in steel with an e-coat and semi-gloss black powdercoat. All mounting hardware is included, along with easy-to-follow installation instructions. 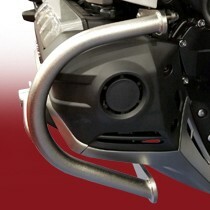 Optional swivel-adjustable Footpeg Mount Kits are available in both finishes and in 38mm and 76mm offset lengths.